At the crossing of the disciplines. In the beginning of the 21st Century, Aubusson’s tapestry know a new lease of life as it rebinds with the contemporary creation and renews its uses upon contact with other disciplines or through research and innovation programs. Initiated since the end of the 20th Century with creators coming from the design world, such as Sylvain Dubuisson, this new period is truly inaugurated thanks to the common public order of the State, department Council of Creuse, with the support of the regional Council of the Limousin, the “Tenture de l’an 2001” in eleven pieces, themed on inventions and discoveries of yesterday and of today serving humanity. It gathers within the art of tapestry artists from diverse backgrounds, such as Philippe Favier or Reza Farkhondeh. The public order or private initiative allows the creation of important weavings, entrusted to well-known artists: Robert Combas, Hervé Di Rosa, Fabrice Hyber or Gérard Garouste. 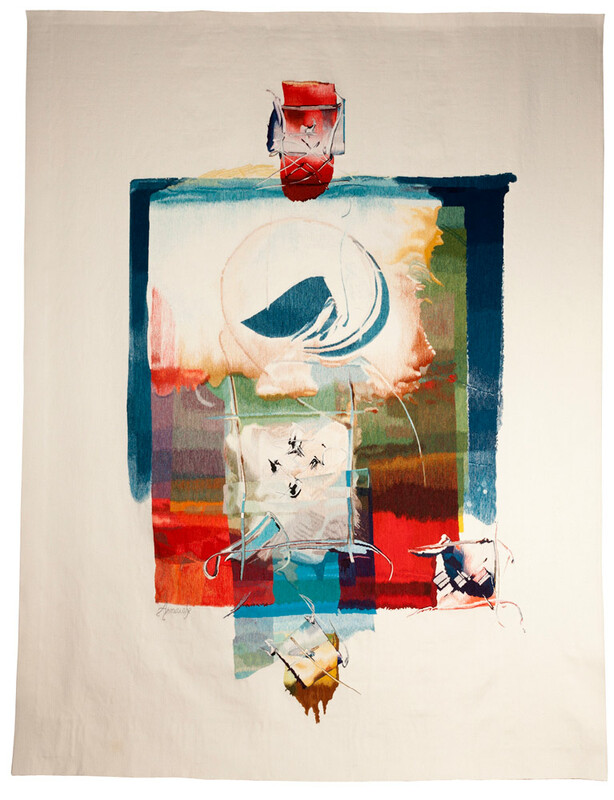 Thus, since 2010, the call for projects of the regional Funding for the creation of contemporary tapestries allows each year to give a strong signal to the Aubusson tapestry, readable both by the contemporary art connoisseurs and the general public, through the request for talented creators, offspring of the painter’s tapestry movement of the 20th Century. The calls for projects allowed the Cité internationale de la tapisserie to sustain the contemporary collection by selecting and having original sketches weaved, amongst hundreds of propositions. The regional Funding for contemporary tapestry creation allows also the Cité internationale to revitalize the creation and the contemporary collection thanks to the development of specific projects, creations in partnership with other institutions and galleries by commissioning the artists or designers: tapestry for the Centenary of the First World War, furniture collection, weaved works of the artists Clément Cogitore or eL Seed etc. Beyond the constitution of a referring collection, the Cité internationale plays a role in the tapestry edition as well. It encourages the weaving development in the Aubusson-Felletin workshops by private individuals, businesses or institutions, by letting them get in touch with the regional craftsman and offering a technical follow-up to complete their project to acquire a weaved work successfully. The yearly call for creation allows notably highlighting a catalog of artistic projects exploitable for Aubusson-Felletin weavings: Laurent Grasso Marlène Mocquet, Philippe Rahm, Perrine Vigneron etc. The laureate projects, weaved for the contemporary Funding of the Cité internationale can be the subject of re-weavings, in the limit of eight copies.